Like to see a show with bite? Every day and night there are a multitude of security guards and their dogs attending businesses, schools, building sites, venues and events in order to provide protection and deter criminals. 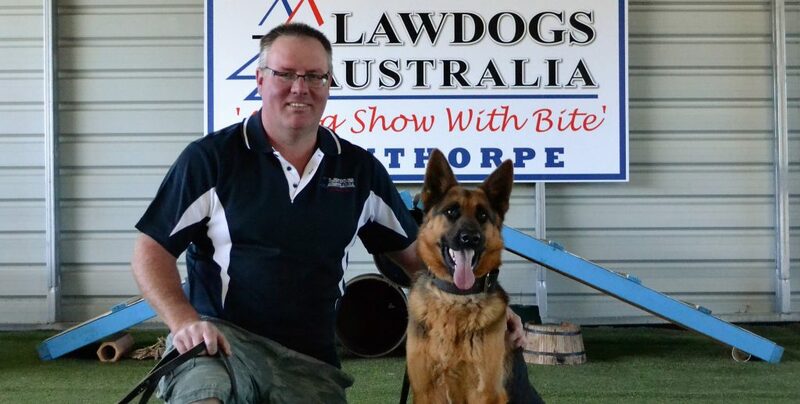 Meet Matt Hibberd, owner of ‘Lawdogs Australia’ (Stanthorpe) one of the country’s most respected training kennels. You may have already caught a snippet of them on ‘Totally Wild’, ‘WIN news’ or the ‘ABC’. Lawdogs train and prepare dogs ready to work in a variety of security applications, protection and detection. There are plenty of furry law enforcement stars in the ‘Lawdogs’ show and as Matt explains, the dogs are trained according to their strengths. Dogs suited to different types of jobs often come from a particular blood line but even within each litter there will still be unique personalities and traits which we should recognize, respect and then train the dog accordingly. You will get to see bite work, agility and detection work up close behind a safety fence and in the comfort of covered seating in their purpose-built area. There are all kinds of props, food and toys used in Lawdog’s positive training. The show is for anyone who appreciates dogs and is a snapshot into a world we don’t often see. Dogs have been used as protection for centuries, but we understand a lot more now about canine psychology, canine drives and how to build them plus switch them on or off by command. Matt gives a thoroughly interesting commentary as he takes the dogs through their paces and adds a little humour as he goes. Their shows are held Wednesdays and Saturdays. Book yourself a place and if you are able to arrive about 20 min’s early you might like to see a few extras such as puppy interaction (so adorable and essential for socialization), dog training or Alpaca feeding. As Matt reminds us… “There is no such thing as a perfect dog, but every dog is perfect for a situation”.